By Jordyn Grzelewski | March 10, 2018 at 12:05a.m. 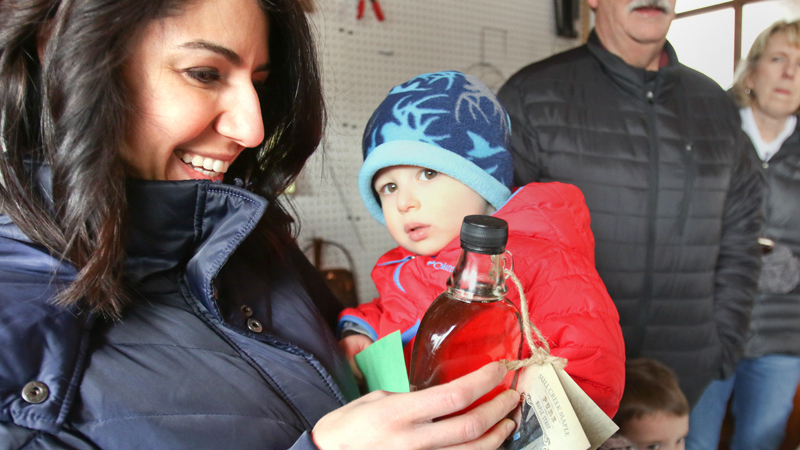 Photo by Robert K. Yosay | Marise Sahyoun and Kyle, 2, check out the maple syrup made by the Rocky Ridge Neighborhood Association. Two events centered around making maple syrup are scheduled today in Mill Creek MetroParks. 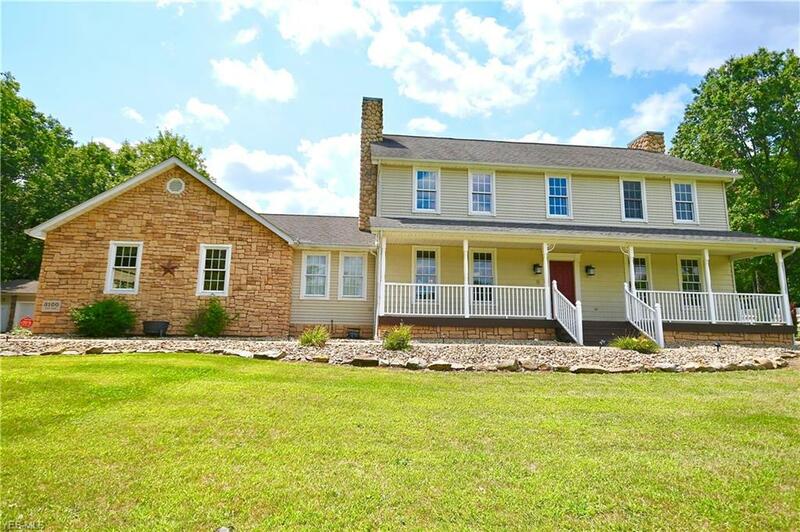 Warmer weather signals not only the approach of spring but the arrival of nature’s sweetest season. Above-freezing temperatures cause sap to rise in maple trees, making it the perfect time to make syrup. That’s exactly what the Rocky Ridge Neighborhood Association will do, using sap from a grove of maple trees in Mill Creek MetroParks. The public is invited to observe the syrup-making process today with two MetroParks events. The Sugar Shack, located behind the Morley Pavilion, will be open to the public from 1 to 3 p.m.
Additionally, a MetroParks naturalist will lead a “Maple Syrup Saunter” from 1 to 2:30 p.m. The 2-mile hike, starting at the Wick Recreation Area, will include a stop at the Sugar Shack for a syrup-making demonstration. MetroParks Naturalist Marilyn Williams taught 3- to 5-year-olds about where syrup originates. In the winter, the sap remains in the tree’s roots. As the temperature rises, so does the sap, allowing people to drill the trees and collect sap. Sap is 98 percent water and 2 percent sugar, so it requires an average of 40 gallons of sap to produce one gallon of syrup. This season, Dolak said, a gallon of syrup has required closer to 100 gallons of sap. Dolak said the Rocky Ridge group tapped about 60 trees this year with 120 taps. Five-gallon pails of sap are hauled into the sugar house, where syrup-makers filter the sap twice. It’s pumped through tanks, flows through a pipeline, then goes into the machine where it’s boiled at 230 degrees, heated by a fire that gets as hot as 1,400 degrees, Dolak said. The sap is boiled until it’s down to about 33 percent water and 66 percent sugar, eventually changing from a clear, watery liquid to a thick, amber-colored one. It’s filtered twice more, then bottled. At the Sugar Shack, volunteers can produce a gallon of syrup in about three to four hours, Dolak said. “Ours will never say low-sugar, gluten-free, because it is 100 percent pure maple syrup,” he added. He finished the demonstration by offering samples to the children. Jack Juhasz was there with his grandparents, Tom and Sherry Opria of McDonald. Asked about his sample, the 4-year-old gave a thumbs up. He did have one critique, though. “It would be better with pancakes,” he said. May 1, 2013 12:15 a.m.
March 9, 2018 10:55 p.m.
April 29, 2017 12:06 a.m.